Tip 1 - Consume Fatty Foods – YES, You Read That Right! We’ve been educated to believe that fats are the devil. 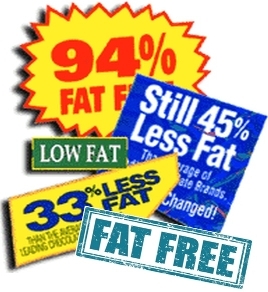 That’s why for decades manufacturers have produced a ton of products, which are “low fat, no fat and fat free.” However, would you believe that these products CAN actually expand your waistlines and speed up the aging process? I’m here to tell you that fats are not the devil. FACT – your body has to have fat to keep you alive. The body needs fat not only to support healthy cell growth but also to protect your organs. You need fat for certain important nutrients, such as vitamins A, D, E and K to be absorbed. Fat is needed for the protective layer that forms around the nerves in your brain and spinal cord. Fat is also needed to produce important hormones such as testosterone, also known as the strength hormone. Testosterone is the result of cholesterol and fat intake via the diet. That’s right, in order to produce many vital hormones for BOTH males and females, you need cholesterol and dietary fat. That’s why in many cases, people on these low fat or no fat diets look sickly, weak, gaunt and are even depressed. So remember – by cutting out fats in your diet your weight loss efforts are doomed. Absolutely not! Science has shown that certain fats such as trans fats and some saturated fats in highly processed meats, cookies and crackers to name a few, have been shown to be bad for your health, not to mention your waistline. However, the right fats will help your body burn those unwanted pounds, protect your health and help slow the aging process. Good fats like monounsaturated and polyunsaturated fats have been shown to be powerful when it comes to burning fat. Studies have shown that the consumption of good fats lead to a higher metabolic rate as well as greatly improved diet-induced calorie burn. So not only is fat important in protecting your body and helping to keep you healthy, but good fats will also improve metabolism, balance hormones and increase your body’s fat burning potential. Copyright © Ultimate Body Transformation. All Rights Reserved.